On September 10, 2012, the “stars aligned” and we happily welcomed one gorgeous girl (Lyra) and one handsome boy (Leo)! This is Csilla’s final litter and we are so excited to have TWINS! “Jack” is a handsome and substantial Vizsla with a beautiful front assembly, nice deep chest, strong top-line and clean movement. A true testament to his conformational qualities, he completed his Championship title on one Specialty weekend, earning three consecutive 5 POINT MAJORS . . . at 14-months of age from the Bred-By-Exhibitor class. Way to go Jack! Once a finished Champion, he retired from the show ring as a companion for his owners. “Jack’s” pedigree holds a proven strength in conformation, agility and field ability. His Dam “Siren” (CH Szizlin’s Ain’t She Inspir’n JH ROM), was the #1 Top Producer for 2007, and his half-brother “Owe’n” (MBISS GCh Tivoliz CC Joint Venture JH ROM) earned that same recognition in both 2011 and 2012 as the #1 Top Producing Sire. “Siren” has passed tremendous quality on to her offspring. Collectively, they’ve earned 8 Championships, 3 Best in Specialty Show Wins (BISS), 3 Best in Sweepstakes Winners, 7 Winners/Best of Winners at Specialties, 1 Master Hunter, 2 Senior Hunters and 1 Master Agility Champion (MACH). Siren is also the “poster girl” for the OFA Champions of Health. I have spent time with Siren on several occasions and in-person she certainly lives up to her “heart-dog” reputation. “Jack’s” pedigree reflects several renown Vizslas, including the VCA Hall of Fame (HOF) “Danny” (BISS DC AFC Riverbend Deacon’s Dandy CD VC ROM HOF) and “ET” (DC Rebel Rouser ET ROM HOF); as well as, “Eve” (BIS BISS Am/Can/Int’l CH Kizmar Caveat Spellbound JH NA NAJ OJP ROM), and “Cowboy” (BISS CH Russet Leather Caveat Kiowa JH ROM). Jack is not being offered at public stud and I am grateful to have the opportunity to incorporate this lovely dog – and his parentage – as part of my line. The name “Csilla” means “star” in Hungarian and her registered name means “bright red star”. Csilla is a beautiful and extremely feminine girl with a heart of gold. She has a stable, sweet and even temperament and gets along with everyone, dogs and humans. As my boss once told me, “I don’t even like dogs, but I like your dog [Csilla].” She is a favorite wherever she goes for her friendliness, exuberance and “up for anything” attitude. Csilla’s temperament is “bulletproof” as verified by vets, trainers, handlers, house-guests and honestly and anyone who has come in contact with her. Csilla is a joy to live with. Csilla finished her AKC Conformation Championship title with three Major wins, and comes from a very accomplished litter, her littermates have Multiple Best in Specialty Wins and an all breed Best in Show. Csilla’s 4-generation pedigree reflects a well-rounded and accomplished list of Vizslas who excelled in Conformation, Hunting, and Agility. 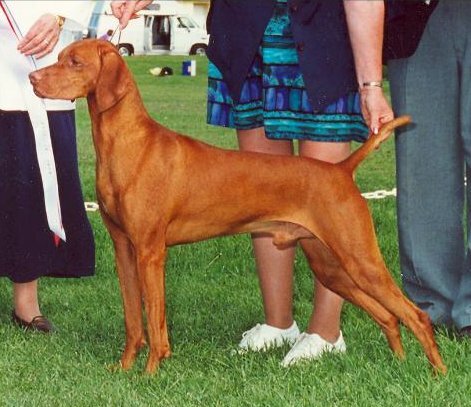 Csilla is a grand-daughter of the top winning owner handled Vizsla in the history of the breed with with 14 Best in Show wins; 14x BIS 2x Nt’l BISS MBISS CH Russet Leather Warrior’s Mark JH ROM “Bismark”. Her pedigree also includes many other distinguished Vizslas known simply by their “call names”; Secret, Charger, Calla, Danny, Gator and Cutter. Csilla is a proven producer and passes on her wonderful temperament, talent and beauty to her progeny; earning her ROM (Registry of Merit) in Spring 2014. She has multiple Champions, Grand Champions, and Hunt Titled offspring, details can be found on the Champions and Up & Coming Progeny page. Click here for detailed explanation of AKC Titles and Abbreviations.